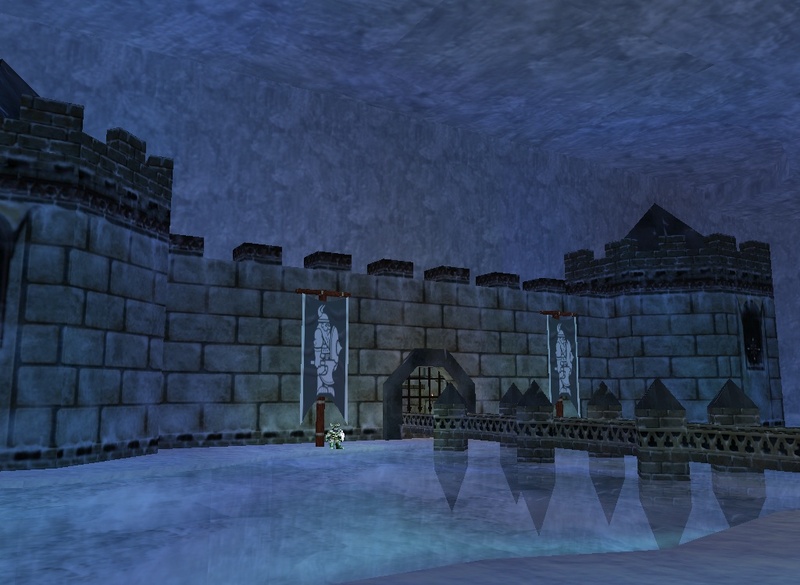 Icewell Keep is an extension of Thurgadin's main city. Here you will find the palace of Dain Frostreaver IV, high above a pit full of tentactle terrors, golems, and frosticubes. The Inner Sanctum of the Ice Dwarves. This zone is both City and Dungeon. The basement of the keep is home to a number of nasty creatures who carry no faction making excellent hunting for ground level 55+. 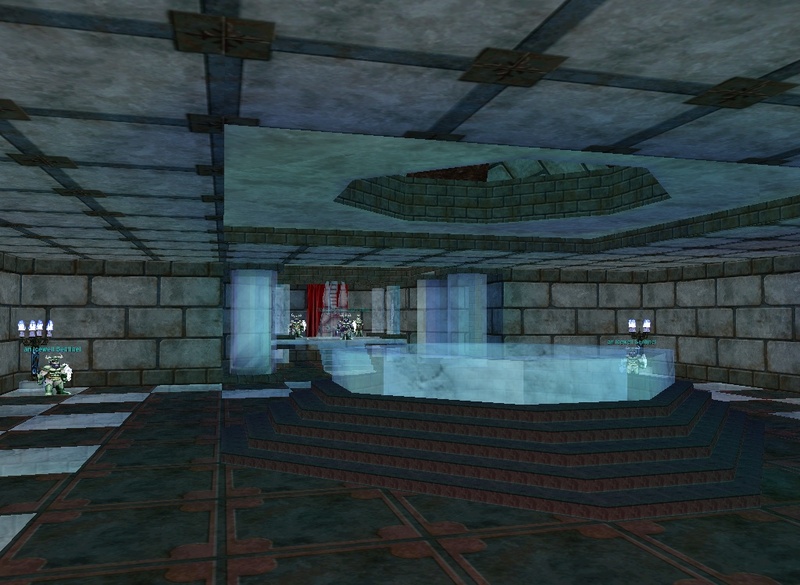 The Top of the keep is home to the Elite Dwarves, with good armour drops, and the court of the Dain himself. Both quests and epic combat can be found here. The Fabled Dain was visibly absent, as was his royal court. (He had been up just prior to starting the ring war, and no one was setting up to kill him). I didn't track to see if he or his friends were hiding (the wiz was there exploring). The servant girl in his bedroom was absent. I didn't go to the tunnels to check them. (Wiz is pretty gimp) There were lots of things looking like corpses lying all over the dwarf inhabited areas. They had health bars that were full. The corpse like things were there for a while (over a half an hour). A slaughtered sentinel, a skwered sentinel, a sacrificed sentry, and a smitten sentry were the ones I saw, there might have been more if I had looked further. The dude who gives out the Dain monster missions was gone. You play a named coldain and can have from 3-6 players. The rogue character is least needed if you dont have 6. The Dain character is the only one mandatory, but everybody considers the 2nd cleric with conviction is mandatory also. There are three missions to do for the augment quest. Its a nice augment and I dont know why many more ppl are not doing these missions. One reason is that since two fabled are in the throne room and see invis and hit for 3250 or so. Makes me glad I chose Skyshrine faction four years ago. 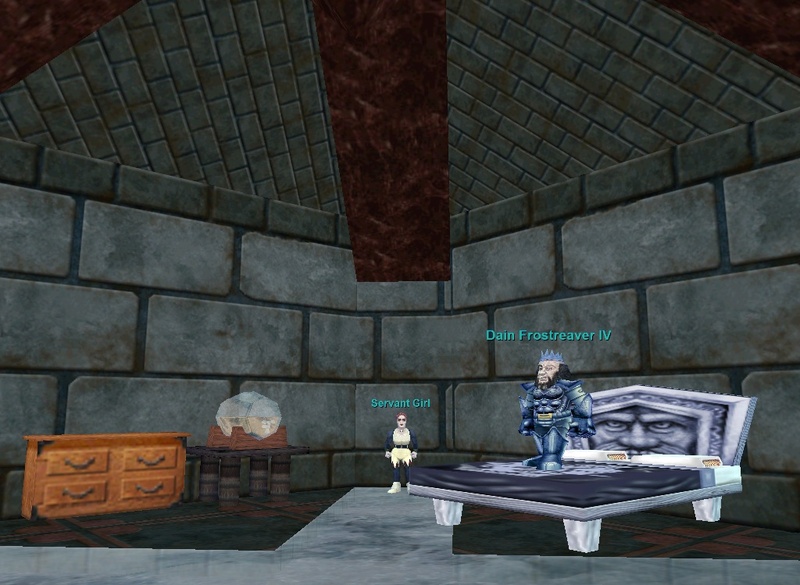 Everybody has to physically be in the small room off to the right of the Throne Room to give the Historian the code word to enter the mission, so that makes it tuff for all those old-timers who chose Kromrif faction or went on Dain raids. I am amazed of how many people dont know how to get to the throneroom. Even more so when so many ppl I have invited for grouping these missions have no idea where Icewell Keep is much less have a clue that you need to enter from thurgadin and come into the castle instead of entering in through the underground tunnels. Many ppl just were not around in the day that Thurgadin was a metropolis of activity. First off I have done several of each but not a hundred of these so cannot give exact exact details like I do in some of my write-ups. The link says to talk to the historian and follow the text. What you want to do is to choose the correct mission based on what your group needs. Since only one of the seals drop, usually always ppl have a say in which mission to do: like they dont need 3 or have only 2 left to complete etc. I always ask what ppl want. Then just follow the historian prompts and say the first/second/third to the guy. Everybody in the grp has to give him a follow up message after chosing a character. ready, prepared, etc are the messages, just watch the text in the monster select window. We went to the fort first, took out the two guards there and then the named in the building. He was ez. Next we took the river south to the named down there. We just went under the mtn and ran past the roaming green stuff in the tunnels. 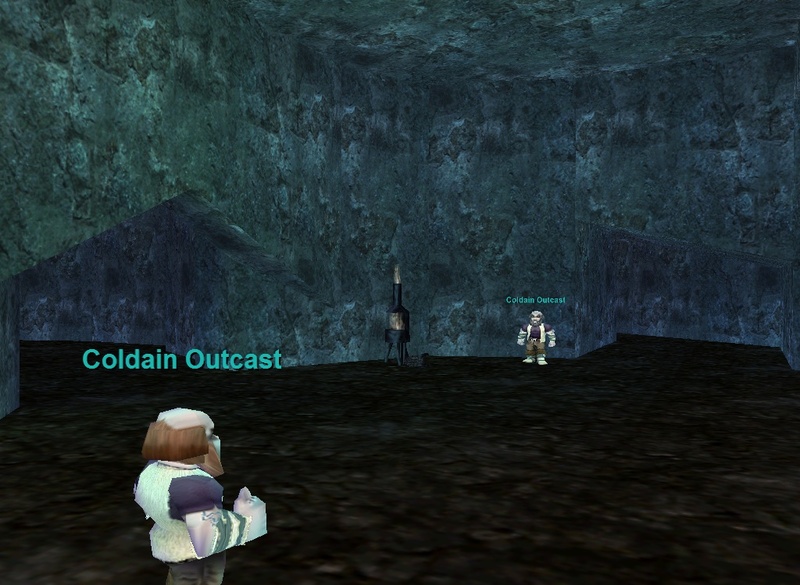 Once we set up by the hut there, we sent in the dain on the named and off tanked the others and was ez also. Couple roaming zone mobs added but they hit for about 10 dmg and everybody has 20k hp or so. Ask your grp which tactic to use there because I have seen grps just kill the named and then just all run for broke to the dragon circle. After the river we headed to the dragon ring and used the same tactic. nobody died. Move your group up toward Thurgadin and engage the simple simple wolves one or two at a time. Now the last step it right at the waterfall entrance to Thurgadin. You need to position the dain with his back against a wall because of the knockback that the named does will push him about 30 meters at a time if hes not boxed in. Just put everybody else on dps and yer done. Our clerics only did the Perfect heal. It heals for 25000 hp and any other heal is just a waste of mana. Keep in mind that the cleric doing the CH for the Dain will need to do it almost continually. Dont wait for 60 health or something, just CH as soon as hes hurt some. This is inside Kael. you start at the entrance and are tasked to kill 10 of the master scouts. Have somebody pull em 1-3 at a time and Dain tank 1 and everybody is dps till all Master Scouts are dead. The important thing is that everybody assist on the Dain because the regular scouts all run at 80% health and will train the zone on you if they get away. Everyone with root (instill) should spam that on whichever scout you are engaging. And dont dmg any scout that you are not actively casting root on. We had three rooters I think and some mobs still got a jump on us, although we managed to get em all dead before they could bring reinforcements. Just let the regular scouts beat on whomever until you get all the masterscouts dead and you lay the roots on the one you're killing. Next step is to take out a named. Have somebody pull him and its relatively simple fight. We had one cleric only do HOT for the Dain and one cleric only do CH for the dain. IMPORTANT IMPORTANT Do not delay rolling for loot or afk or anything after you kill the named. You have about 90 seconds to roll, loot, and scoot before 50 giants will pop on you and dance on your corpses. Tell your group this strat before you engage the named. Announce that you roll before the final named, or as soon as he is dead, first roll is for the seal, second roll is for any loot, everybody grab a shard fast, announce pass if you dont want something and run for the eastern wastes exit as soon as your done. The group leader needs to keep this quick or ppl will be out exp if they miss a shard, or out loot. Most dangerous thing: letting a scout run away. I have tried this mission three different ways and have only won it once. I was lucky and managed to win the seal on the only time I won this mission. We have tried having someone run and tag and bring the giants to us at Thurgadin, and have tried advancing the troops the instant we started the mission and doing all the fighting at the EW zoneline. The thing that we did where we won was dont advance any coldain. We just did a HOT for the mt since the dain was off hiding somewhere, then send him in on the named. All ppl were on the named. We did this just a hair after the coldain engaged. We had a puller aggro the Kromrif and take em to the middle of the coldain formation since their normal path is strait up to Team A and not in the middle of B/C. Team A got wasted before any other coldain died. Here is the thing. You need ppl who can set their abilities and spells fast. Its best to go over any strats ahead of time because once you zone in, the timer starts and the Kromrifs will be coming soon. If you have ppl with new classes that they have not played before, they might not have their abilities set in time. Its very ez to just suicide the dain or everybody drop the mission and just restart it fast. you all warp back to the historian room and can just give the code words again. That way you can do 'load' abilites if you saved them the first time or were not ready for fighting. The intent on the third mission is that you need the coldain army alive for the fourth and final named general because that is when there are the most kromrifs attacking and you need max dps. Since you need the dain on the general to eat his hits so your army doesnt get killd, he will be in the thick of things. Often I saw him die to the dps of the train before a CH could land. Consider a 5 second CH rotation for his 25000 hp azz. Other ppl should not jump into the thick of things because you will gain multiples aggro and not survive past 20 seconds since the healers on concentrating on the Dain. Just pick off giants around the edges of the mosh-pit. You will have four coldain captains that are your best allys and then about 36 GI Joe coldain types and about 8 coldain clerics for your army. The clerics are very bad about positioning themselves and might end up on the front lines. If that happens your fight with the general will be short and unsuccessful. In every case where we got pretty close to winning and that one time we won, every coldain was killed. Their own clerics wont heal em fast enuf: they mostly ran around and melee'd; and I couldnt get a CH to land on them either. I was a cleric the time we won and it ended up with six kromrifs and the general all on one of our warriors. I was fast fast ch'in the whole time and as ppl were popping from being killed, they would run up and assist the guy I was healing. By the time I was down to 11m or so the other cleric popped back on with 50m and could continue the ch spam. She kept our MT alive long enuf for me to be killed and come back with 50m and take over the CH spam again. It took a long time for us to finally kill off the last kromrif shamans and scouts and a ton of mana. The guy playin the Dain just waited until we had about 4 kromrifs left and the general was dead before he came over and helped out. My vote would be to use the dain in the last fight to help but not necessarily as the MT. He could do more of a cleric-protector person role very easily. that way the two clerics could do their stuff much more easily. I was running all over the place trying to pass aggro on the diff melee fights goin on. If you fight at the EW zoneline the mission is pretty fast and you will need to conserve healer mana for the final fight. If you fight at Thurgadin you will have some extra delay built in. for the second mission it should be noted that the regular scouts will run at 80 but they are not soical. In other words if you let them run they will not train you. The only way you will be trained is if you chase after the scouts and get the train youself. It is possible to do the mission by having all dps hit the scouts first to 80 and letting them run in fact. It does save the mana of the cleric some; however, I have also seen some who don't understand this strategy create trains. I wouldn't suggest the strategy unless you trust you group well enough that when you say 'get the scouts to 80 then let them run, DO NOT FOLLOW' they understand the follow part. The scouts that run on mission two are a very big problem now, and any one of them that runs will result in massive trains back to your group if not killed. I don't know if this was recently changed but perhaps it was... as the scouts reach a certain location, many mobs spawn and run for your group, which are all social to the scouts, and the agro transfers to them, as they run back, any other scouts or 'master scouts' on the way will agro with the returning 'spawned mobs', and you'll have a much harder time than simply rooting them and killing them. There is really no need at all to stay back at the zone in if your group is at all smart (and awake), simply placing one cleric behind the scouts a bit and having them chain root (or having a Paladin do this), keeps them easily rooted enough to avoid any of them from running, a good place to fight is just before the first bridge area (the one that goes down under the arch), as you have a very long space for rooting instead of having to follow them around corners and have your root not land (as they are out of site). mission 3 is easiest in my opinion, where most people mess up.....after they hail the general, they never read what it says, you have to command the troops. My guild and I have done this one to get everyone thier seals, same as #1 and #2, tactic: Leave the dain at the general, he commands the troops. warrior goes to EW zone and pulls. Troops never leave starting position other than to attack, do not advance them or you have to wait on thier short little legs to get into postion. With the dain safly up commanding the troops, no one need die or worry about loss. The key to sending in the troops is to send them in REVERCE order, start your hotkey (social) with Unit D Forward, then Unit C Forward, down to unit A, this will have the Coldain army attack in one mass instead of waves, never lost one like that. Also, either it is bugged, Dain does not know how to follow instruction or whatever, but here recently, the troops have been wanting to automaticly advance to the next postion...DO NOT let them, make sure the dain tells the general...Unit D fall back, Unit C fall back, etc. Note to the puller: your best suited for telling the dain when to send in the troops, best time for that, when you run accross the river, into the middle of the army, and you see the giants running down the hill at you, thats when you want them sent in. 2nd Note to puller: After you pull the wave to the coldain army, DO NOT stop running! If you stop running, that entire pull will aggro you, and you will be dead, instead, kite, do a WIDE kite in the biggg area in front of the coldain. Once you have ran out far enuff, all of the giants will be mad at certain units of coldain, giving you the ability to run in, and help everyone down the bosses of each wave. Along with the seal on #3 there is a 65hp and some other stats aug that drops, and a mask, nice mask, for the pure casters. Anyway, hope this helps, any questions make a mule on Xegony and send a tell to Tuda. ya, it takes you to the tizmak caves. unless that's a second one. I am a nuts lvl 1 I run down here and I was just wondering. Will any of the dwarfs attack me? I never killed dwarves, but the tunnels under the Keep are a nice place to hunt. Benefits are spells (Improved Superior Camouflage dropped in here) and a ton of Velious Gems (Crushed Opals...) Some items too, but they are very rare (2 Jagged ice Shards seen). We entered by the tunnel, under Thurgadin's bridge. We killed many Tentacles, Frosticubes and Coldain Skeletons. And some occasional golems too. Most of them are 49-55. They hit fairly hard, and have a *lot* of HP. But they does not seem to have good resist. A single group can fight on the zone line. Level required is 50. Level recommended is 55+ or fights will be very long. Required too: Slower or Cleric. FD Puller OR Enchanter. A good Tank. As many dmg dealers as possible. I went in several times with 2 groupes of 48-59. One cleric, one Shaman (59) and one enchanter minimum. After you zone, there is one spawn with a Frosticube in the first small room. One roamer can walk to the zone. 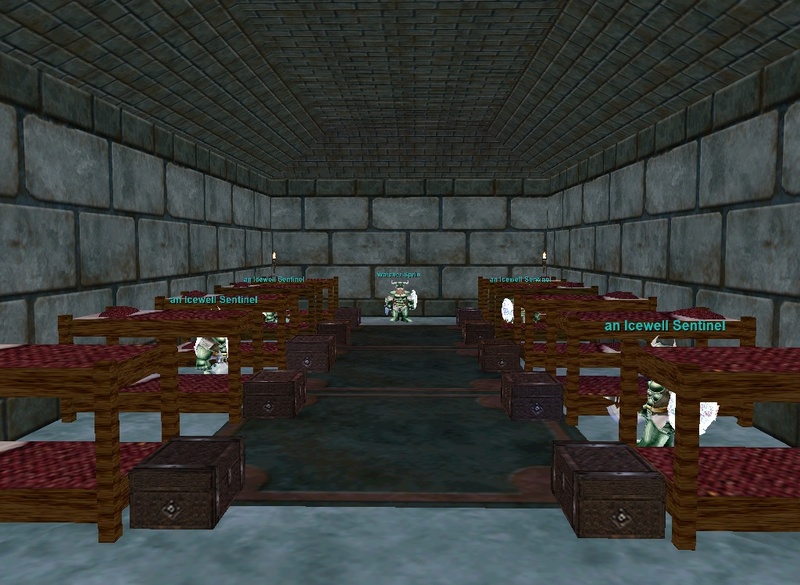 The safest spot to hunt in is the first large room. There are 2 spawn points on a side of the icy river. Fight on the opposite side. The good thing is that there is no mob that can see invis if you die here. CRs will be quick and easy. Respawn time is fairly quick. Dunno exactly: Between 15 and 25 minutes. Given the (long) time of each fight, you'd better time the repop. Golems and Spikes cannot be mezz'ed. They can be charmed. Frosticubes can be mezz'ed. Our 55 Chanter was unable to charm them, though... She tried several times. Skeletons can be mezz'ed easily too. I was wondering what level could an enchanter go here and get groups to hunt? "High Elf the other white meat." Can a Barb Warrior with no previous faction hits walk through Icewell keep non KOS? If not what will aggro me? What is the easiest way to check my Dain faction? I know in Kael there are 3 factions, one for guards one for. Kromriff, King Tormax and Kromick (or whatever). Are there equivilent factions for the dwarves? IE- normal guards, elite guards and king himself? just wondering, when all the spells (slows, dots, etc...) were resisted, was the caster in melee range? i know that makes a big difference on FGs and such, i'm curious if its the same for these silly dorfs. OK What Faction hit do you take for killing these guys and is it possible to become kos in thug if u kill enough here in Icewell keep. i suppose u lose faction even in icewell keep and well only things my monk was able to loot was a shield and a axe but maybe i will get lucky and loot some of the nicer stuff but i dont want to kill any coldain faction as i prefer the faction over the drakkals personally. We got a necklace off of loremaster solstrin, 3rd time we killed him (he seems to always drop spells btw): 6cha 6wis and 4 charges of alliance. 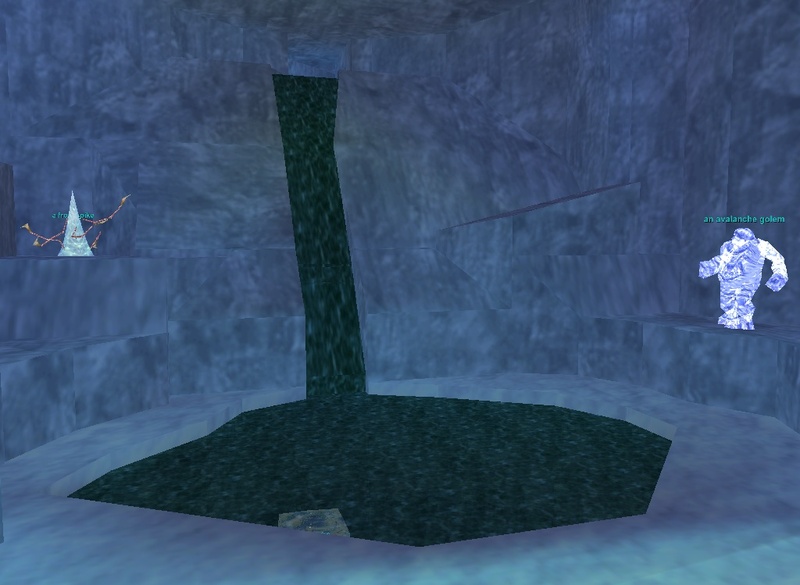 In order to get to the evil monster part of Icewell without dropping into the pit you have to jump down a well (course if ye a dwarf hater, i suspose the evil part of Icewell would be the keep). 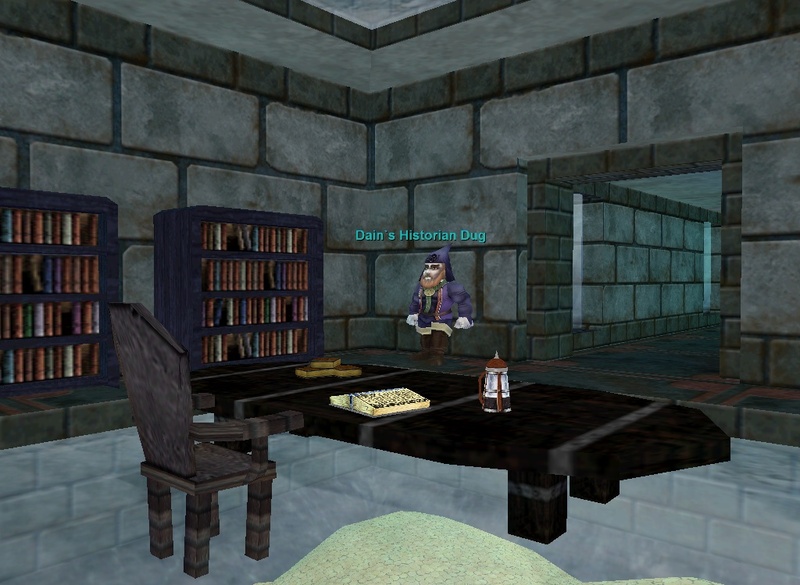 The well is located in the keep on the top floor in front of Daln IV's (the king, whatever his name is) throne. When you jump down you will be dropped into a small pool of water, home of a vicious Frosticube. However ye need not worry iffen ye hab invisibility of some sort, be if from hide+sneak or an Invis spell. The pool is suround by a Avalanche Golem and a Frostspike (spike is able to see through invis so be careful). If you are hiding+sneaking you will have to unhide and sneak in order to escape from the pool of icy water. It's not impossible to get out of the well without drawing the attention of the Golem and Spike, just watch where you get out. Grizznot is, as said, level 60 and a very nasty creature. He looks like a bear from the Eastern Wastes only 5...6...7...8 times larger, very large, heh heh, cannot miss him. He sees through hide+sneak (so i assume invis, too) and you HAVE to go by him if you want to continue on. I was barely able to sneak by, by hugging the wall so tight it screamed for air. There I was able to sneak into a side passage to the left of his great personna. The side passage is really another chamber, with two Frostspikes (can see through invis). There were only two of them, and they moved along an iced-over streambed that led into another room. They returned back however, so I suspose that they sort of patrol that area. There I met my fate. As I was attempting to sneak past them, one very unfortunately caught me and attacked...I died within seconds. There appears to be no way out of the zone once you commit yourself down the well or into the pit...other than Evacing or Gateing or Porting, etc. Though you can zone back into Thurgadin from the pit, you cannot escape the pit without some type of port/gate. If you wish to hunt the zone I would choose the entrance from the pit, as you can zone without having to gate/port. Also much easier unless you have invis/hide+sneak, as you will have to fight a frosticube in the water when you drop down through the well. The plus for going down the well, however is that its a very short distance to Grizznot (could be considered a plus =0P ) without too many mobs in the way. The Sentry drop the boots and gaunts. The Sentinel drop the Arms and Bracers. The Watchers Drop the Legs and Occasional BP. The Two named sentrys in the bleachers area drop the helm. one is sleeping the other is stading across from the Watchers. Can anyone give me some information on this armor drop, I've read they drop off Icewell Sentry and Sentinel. Anyone have any information that might help (ex. respawn time, what they spawn with, what level/group is needed, etc.) I'd like to get a set for my warrior, thanks. I myself was there and i found 3 other peeps lookin for the armor as well as myself and there was a 55 monk, and 54 druid camping the sentinel/sentries at the zone( 4-5 spawns in all i believe). I could complete heal him on average 2 times per guard(3-4 on sentinels) and be fine. BUT it is required to have an enchanter or pulling monk to do this effeciently...otherwise you will NEED a mid 50s group to break the spawn at least. Sentries drop the more common stuff like boots and gauntlets and i think bracers(can drop other stuff but EXTREMELY rare). And if u kill enuff guards and save the weapons and i believe they drops spells too this can be quite a benefical trip.... Also, the monk and i weren't grouped and he got 2 bubbles of blue in 2 hours i believe, so fairly good experience. Also, respawn time seems to be around 10 minutes so good flow of spawns and mobs if u have a good group. Sentries drop boots and gaunts. Sentinels drop vambraces, helms and bracers. Watchers drop greaves and breastplates. Spells drop off of all of 'em and in pretty high quantities. Forget about the enchanter, these mob's don't mez. At least, a lvl 53 chanter can't mez or charm them, period. We've had some luck (mostly bad) w/using a monk to split mobs. Finaly we've decided the best way to do it is to just pull 2 at a time and split tank 'em. I don't know if a single group in mid 50's can break the spawn or not. I do know that 2 groups in the low 50's/high 40's can. Here's how we do it. We start at zone line and pull the first 2 clusters of sentries (2 per). Then we pull the 2 sentries just inside the keep. Normaly you're gonna pick up a wandering sentinel as well. After that we pull the other 2 wandering sentries and the rest of the sentinels, in groups of 2. Finaly, we pull the 2 watchers and named sentry. Then we move into the arena/counsilor hall. From there you can pull the 2 watchers and the sentinels, and have fewer sentry pulls clogging up the works. There are 4 spawns in the hall. One is a sleeping sentry (wimp) and 3 are councilors that come in when court is not in session (also wimps). Keep them clear and pull away. Lemming is right on about the drops, but 1 group can break the zone all the way into the castle with a little trick if they do not have a monk. A monk in thier 40s can effectively split the mobs as well. Before you pull have everyone that is KoS to the dwarves move to the right side open area in front of the bridge that the dwaves run across. Then have a tank run up and attack a mob, and usually you will get 2 or 3 on the pull. The puller then simply zones, and the mobs will usually wander back to their places 1 at a time. By the time the puller zones back in, the rest of the group will already be engaging the single target. Word of warning about this zone: pathing can be strange at time, and if you see the dwaves racing back and forth on the bridge near zone in, have every zone to clear agro. Not doing this can cause mobs to suddenly pop right in the middle of a battle. 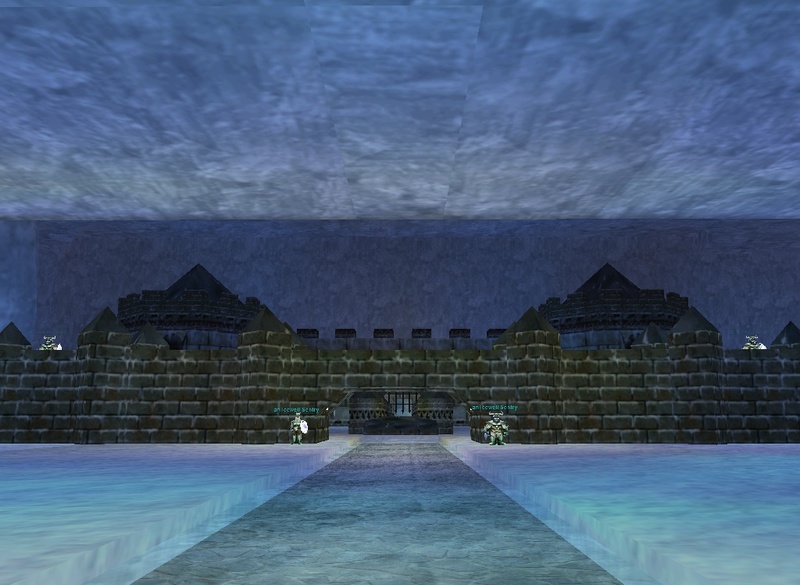 I led a raid in Icewell Keep on 01/20/01. All were 50 to 55 accept the rogue who was 48. We also had a Guild member bring a token crack dealer (29 enchanter) that was there just for clarity and augs. Poor little guy was always OOM hehe. Went in via the tunnel in under the bridge in Thurgadin town near Great Divide zone. Tough fight from the begining. Fought Frosticubes, Avalanche Golems, Frosted Spikes, Coldain Skeletons, and Glucose. Respawn time is relatively fast, 20 to 30 min. This was an impromptu raid that I formed with our guild and a little word of mouth. We were doing well, but near the edge of safety the whole time. The Shamen's entire job was to slow the mobs. They hit and double hit for 180s. We used a 54 paladin for rooting adds away from the others (poor man's mez) since we couldn't get a free enchanter at the time. We used a 54 warrrior to pull to zone, till first room was clear. Pulled to that room till path was clear to next room, etc. Taking lefts the whole way. We were ok, and had time to recover mostly. The third room was were we ran into problems. Roamers were more prevelant there. Glucose stumbled on us, then 3 more during battle with Glucose. 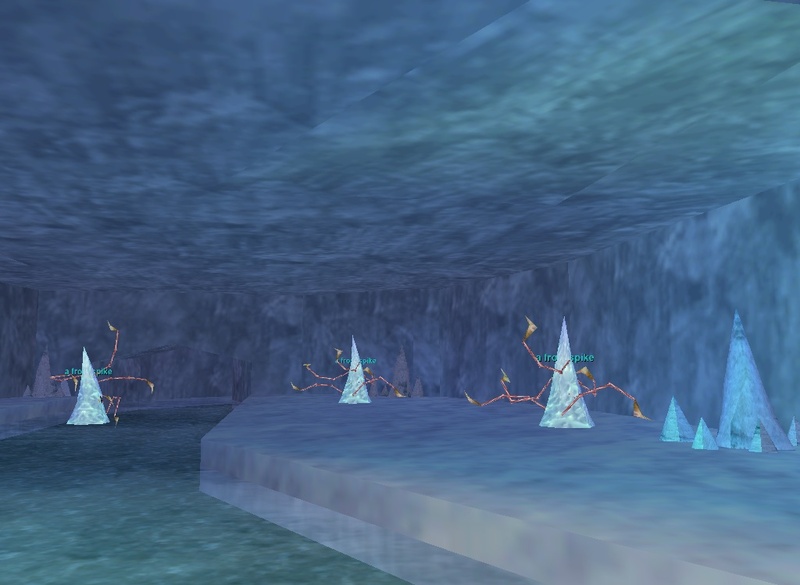 Glucose is one of the named mobs of the zone. This zone should be regarded as an escapable plane raid atmosphere. We figure each mob had about 10khp or more and were between 50 and 55, accept the Glucose we think was 60 could have been as low as 57 (highest that had time to con was 54, RED to him). Note again, respawn time is between 20 min and 30 min. Be warry of backtracking. 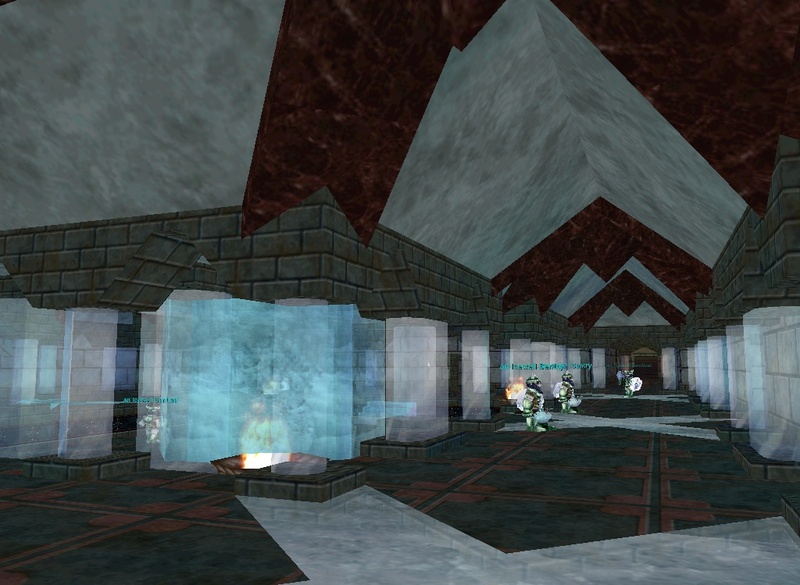 Upon zoning in you will be attacked by one or more mobs in a small hallway. Once you clear a bit, you can move to a small room that is more manuverable. We had 3 deaths during adds after Glucose (while pleading for SOMEONE to loot). Would not have had any deaths if we were not trying to get loot off of Glucose. Rogue was able to drag bodies with hide/sneak even though some saw through it. He said agro range wasn't large and he could go around them. Also make sure you have an enchanter. We tried hard to get one, but were unsuccessful and probably could have gotten further with one. Slow these mobs. You MUST have either shamen or enchanter. This is not a recomendation but a requirement. These mobs hit hard, usually upwards of 300+ per round (double 180s). Not that bad if it's one mob to fight, but when it's a constant flow of them, your cleric will be OOM fast. Rotate taunts. One group usually does most of the damage (ie exp group). Try to rotate groups around on who will taunt. This way one cleric is not yelling "/ooc 20 mana" all the time. Have the group taking the least damage taunt as much as possible and tell the others not to taunt as much. Bring bards. There is a nice bard bracer that drops here, enctice a bard per group to come for mana songs to help out your clerics. That mana song will sure help along with Clarity or C2. Comment: Found on Glucose in Icewell Keep. All the gems are tradeable. Have someone be holder while fighting and lotto them after. You will not have time to discuss what gem and who to lotto. Thanks all who helped in this raid ! ummmm i seriouly doubt that u slowed ANYTHING in this zone. I play 53 shaman and i went to this zone for some dorf killing fun. try to slow stuff like a good shaman. After the 20th resist in a row, I gave up. The dorfs here are almost 100MR. The enchanter we had with us couldnt mez them for the life of him, even with 200cha and tashised. If you want to hunt here, be tank and healer heavy and dont expect your enchanter/shaman to get jack to stick. Agreed, the dorfs here have insane MR. However, he was talking about the beasties down below, not the dorfs. FOr the dwarfs, they are pretty much 100% MR, PR, DR and CR. I play a shaman and was bored during some dwarf killing, so i load up some disease, poison, and cold spells. Started blowing all my mana on the dwarfs. they resisted every DoT and DD that i hit them with, EVERYTHING! talk about tough little buggers. ohhh fire attacks stuck fine. the mage in the group was hitting his nukes for full almost everytime! Yes, they have very high resistance in every area except fire based spells(fire was rarely resisted for me). However, they are not immune to magic based. I was FD pulling the dwarves, using siphon str to gain agro. About 1 in 5 times the siphon str stuck to the dwarf I was pulling. It is magic based. So I wouldn't discount that these COULD be slowed. It is just incredibly hard and mana consuming to do. Your's is possibly the best well written post on a zone that I have read, certainly in a long time, Nrgizer. Good job! Now it's time for me to activate my monk again, get a group(s) together and give this a shot. Thanks! There is a dragon that is sitting at the wall and the 5 pillars on the eastern side of the large room. He didn't see me and as I was not ready for a fight I snuck away before he detected me. Anyone have any ideas on how to take this thing down? I'm guessing he con'd red. Yeah, he conned somewhere between maroon and purple to me, and since I was alone, I snuck out to live and fight another day. I went in a couple of days later and it wasn't there anymore. Makes me wonder if it is a sporadic spawn or needs a trigger. Ummmmm, ok, I went there and I didn't find the dragon you talked about in the first post, but I found all sorts of guard/sentry types who conned even to me. There are many pillars there, but I wasn't able to identify the 5 eastern ones. And which large room are you talking about? Could you give a clarification, please? #Anonymous, Posted: Dec 18 2000 at 4:05 AM, Rating: Sub-Default, (Expand Post) I forgot to say that I am a 47th rogue so it prob is WAY over my level. it will be a while b4 I can kill him. Please write about your experiences and let me know what you and your guild/group find out. I wanna go in and give him a try when I get a good task force to take him down. PS: Do you guys post here often? I noticed we have almost identical posting times. Kinda weird and freaky... two people thinking of going to the Keep at the same time! How do you like Scars, so far? Good challenge for me. I like it. Showing 25 out of 79. Click here for the full list.